Little Tigers in Gresham is a program specifically for children under the age of 6. The classes are always full of energy to provide your child a fun learning environment. Through our Little Tiger program, your child will learn what it means to be respectful and kind to others, while building lifelong friendships with classmates and instructors. Most importantly, your child have the best time of their life! Our instructors are knowledgeable and skilled so that your child's needs and preferences are met in a timely manner. We want to see everyone succeed on the mat, at home, and at school! Little Tigers in Gresham will help your child perfect basic motor skills, social skills, and listening skills. Before you know it, you will see a dramatic difference in your child's behavior and manners. At World Champion Taekwondo in Gresham, we offer every child a safe and friendly environment to ensure they learn martial arts the right and proper way. 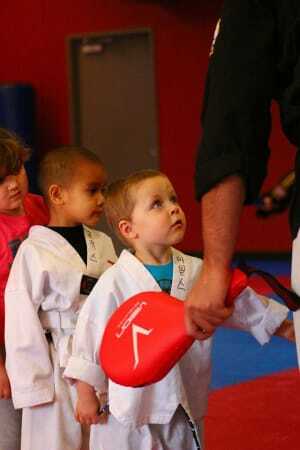 We guarantee your child will love the kicks, punches, and jabs that accompany martial arts, while you love the boost in confidence, respect, and self-discipline. Your child will learn valuable lessons that will stick with them for a lifetime. If you would like to learn more about Little Tigers in Gresham, all you have to do is fill out the short form on the right side of this page, and we will take care of the rest. We look forward to speaking with you soon, and can't wait to start working with your child.